Have you ever wanted to hear straight from another parent about what it’s like to have a child with hearing loss? Mothers know best, as they say! 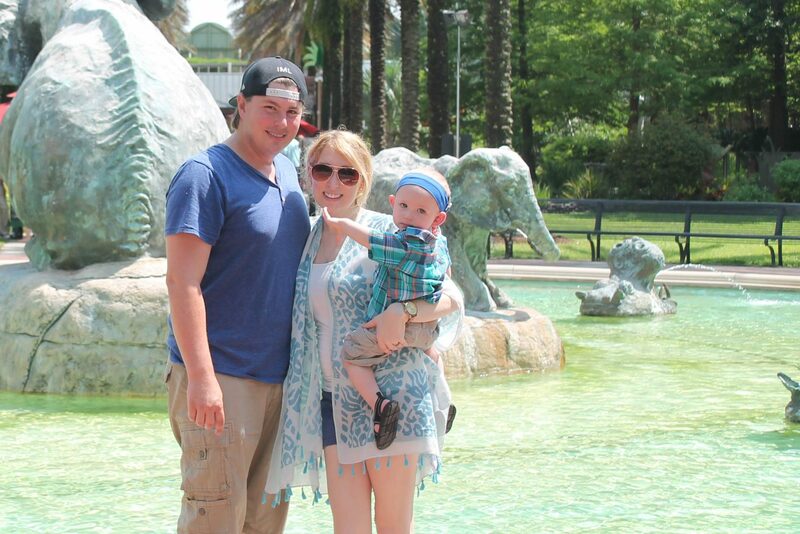 Meet Chelsea, whose one-year-old son Elijah is a bilateral cochlear implant recipient. Chelsea shares how the hearing journey with MED-EL began for their family, including the confusing, funny, frustrating and joyful moments along the way. “Elijah was born with severe-to-profound hearing loss”, is what our son’s audiologist, Amanda, told us that made our hearts drop. Even though there is nothing wrong with being deaf, it is a shock knowing that our child may not be able to communicate with us, the only way we knew how to communicate. Amanda went on to tell us that hearing aids will not help his degree of hearing loss but he may be a candidate for cochlear implants. As soon as she further explained cochlear implants and mentioned the word surgery, I burst into tears. My two-month-old baby boy, who I was currently holding while he slept on me, may be a candidate for surgery at one year of age. Michael, Elijah’s dad, cried also. He cried more than I have ever seen him cry before. Today, we are the happy and proud parents of a CI superHEARo! After Elijah failed his newborn hearing test, we were referred to an audiologist a month afterwards. After the first test, his audiologist thought he had mild to moderate hearing loss but then his following tests determined it was severe to profound. Not only were we new parents but we were new hearing parents of a deaf child. Diaper rashes was the least of our worries. Michael and I felt totally lost until we became further educated about what we could do to help Elijah. The first step we took in helping Elijah was getting involved with other people in the cochlear implant community. Living in Louisiana, our state’s deaf school is the Louisiana School for the Deaf. They offer a PPEP (Parents Pupil Educational Program) for all parents with a baby diagnosed with some degree of hearing loss. Through this program, we met so many other parents that have children with cochlear implants. I think every parent will agree, you can talk to as many doctors and representatives as you can find but there is nothing like advice from a fellow parent. Meeting these parents and seeing how happy and natural they were, really helped to change our still confused and bleak perception about Elijah. Making the important decision to go with cochlear implants was a bit of an easy one for us. There are a bunch of reasons but the most important deciding factor was communication. Communication really is everything when it comes to relationships! We started signing with Elijah when he was very little and our hope is that we will be a bilingual family speaking English and using American Sign Language. Even though mommy and daddy sign with him sometimes, other people, like his cousins may not. As someone that grew up very close to her cousins, I know those relationships are very important also. A cochlear implant provides the opportunity for Elijah to speak to them and others. Our goal as his parents is to open up every door possible for him. I think I speak for all parents of a child with a cochlear implant when I say choosing a brand is tough and scary! Our surgeon told us so many times, “This is something your son will probably have for his entire life so it is one of the most important decisions that you will make.” Talk about pressure! Michael and I did not take this decision lightly. I researched every company in depth and we met with the different representatives. With all the facts that I was provided with, the only brand that I wanted my son to have was MED-EL. The electrode, alone, was enough to set this company apart! This was a decision we made as a family prior to my contact with MED-EL. MED-EL has the longest electrodes out of all three brands. It is the only one that stimulates the entire natural frequency range of the cochlea! The more possible sounds, the better! The surgeon will also be able to choose from different customizable electrodes to find the best fit for your child’s cochlea. To top off the electrode, MED-EL is the only company in the industry that has an implant for high resolution 3.0 Tesla MRIs without having to surgically remove the magnet! I am the type of mama that worries about anything and everything. Knowing that if my child needs up to a 3.0 Tesla MRI and he won’t have to have surgery, is a huge plus in my book. As if the electrode was not enough to convince us, MED-EL makes everything backwards compatible! This is more long-term thinking. Basically, this means that if your child has an older implant, they will be able to upgrade to the newest processor and accessories. I definitely do not want my son to be left behind when new amazing technology comes out! You would think, every company would make this a priority but not all do. For more info on why we chose MED-EL, you can check out my blog. Elijah’s surgery went very well! Although, the first 24 hours afterwards was a little rough with the anesthesia. According to his surgeon, some children are more sensitive to it. After it was out of his system, he was trying to run around the hospital! Children are such troopers! Next came one of the best days of our lives—Elijah’s activation! Some children have reactions and some do not. Elijah did have a reaction! He was very unsure and didn’t know whether or not hearing was a good thing because it was so new. He quickly decided it was a good thing! Currently, Elijah has been hearing for almost 3 months! Michael and I absolutely love watching him react to different sounds! His favorite activity is swimming. He is such a little fish! 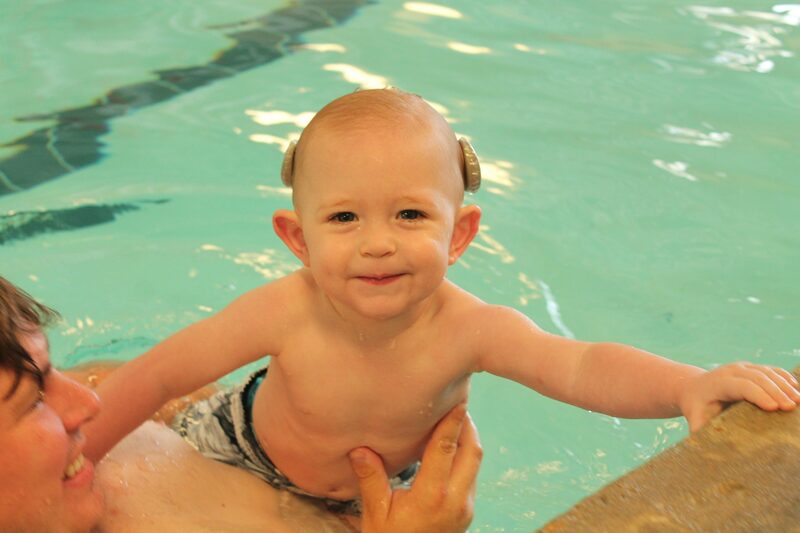 I love that we can waterproof the RONDO and he can hear during his swimming lessons. One day, at swimming lessons, the children were all playing with little water toys at the end of class. One boy that Elijah was standing next to, shrieked very loud. It startled Elijah and he jumped back and just looked at the boy like, “What?” Michael and I thought it was so funny because we are still getting used to him responding to sound. He has also been mimicking sounds! At his speech therapy appointment, he copied the sound, “moo” four times! These little steps are such big accomplishments! We are so blessed to be on this auditory adventure! Chelsea will be taking us on Elijah’s hearing journey through a series of upcoming posts on the MED-EL Blog. You’ll be able to get tips and tricks on bringing up your child with hearing loss—straight from a mom!